country has an insurance reimbursement system; and patients and staff may not speak english. Can your system adapt to different socio-economic conditions? It is said, "healthcare is more regulated than the nuclear industry." Many governments mandate medical data remain in country. Additionally, integrations with ecosystems of respective countries are essential. What do you do when your system is inflexible or expensive to meet these requirements? Sanford World Clinics delivers health and healing around the world. Learn how Sanford World Clinics implemented eHealth solutions in over 30 clinics in Ghana in under 15 days bringing the latest in care and technology to the underserved population. Sanford Health is an integrated health system headquartered in the Dakotas. It is one of the largest health systems in the nation with 45 hospitals and nearly 300 clinics in nine states and four countries. Sanford Health employs more than 28,000 people, including more than 1,300 physicians, making it the largest employer in the Dakotas. Their initiatives include global children’s clinics, genomic medicine and specialized centers researching cures for type 1 diabetes, breast cancer and other diseases. Sanford World Clinic is the global arm of Sanford Health, originally created to provide primary care services for children, but eventually expanding to serve people of all ages. Broader primary care services, regenerative medicine, specialized procedures, weight loss programs, diabetes research and clinical education, are just a few of the specializations developed to serve populations around the world. The organization aims to make healthcare accessible to as many people as possible and is always expanding its scope of services to meet the unique needs of the areas they serve. 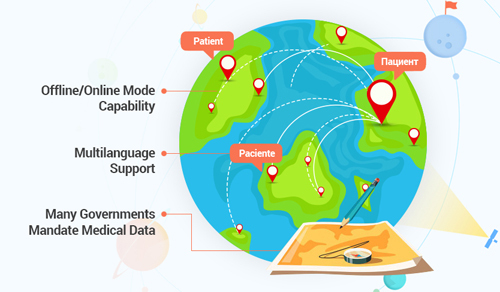 In this quest to provide healthcare to a global population, the models implemented at each location needed to be customized to meet the specific needs and opportunities presented in that market. The custom requirements had to be translated into a technology that would not only be the backbone of providing health care but also enable centralized control and supervision. Their search ended with blueEHR. How to centralize operations and achieve real-time transparency when operating in regions that have no/low bandwidth? Organizations operating in disparate regions of the world are often confronted with the “connectivity problem.” While organizations find benefits from deploying a SaaS solution, the connectivity problem prevents them of deploying a cutting-edge SaaS solution. Most solutions are either SaaS or onsite. blueEHR solves this problem with the hybrid model. blueEHR is built from the ground up to work in low-to small bandwidth environments and inaccessible terrains. The architecture includes lite mobile apps, containers for local installations, and synchronization services that tie the pieces together for seamless management visibility of data. blueEHR offers an onsite version(container) of the program that enables offline usage. The data is then synchronized to central servers when the bandwidth returns/is available. Onsite installations are meant for care hubs like a clinic where patients visit for care. blueEHR Lite applications enables caregivers to go on house calls to remote locations. The caregivers are armed with a mobile application that populates the medical records relevant to the visits of the day. They update the centralized database on return to the facility. Database synchronization could be a challenge when data comes in from multiple sources like onsite installs and mobile apps. The blueEHR hybrid model is tied together with our database synchronization services. Each offline component would sync with the central database in a user-defined protocol enabling the primary IT team to run analytics. How to model systems to adapt to the local culture, workflows, and skill sets of each location? blueEHR configuration tools helped Sanford design six input screens that accommodate all tasks related to clinical operations, each accessible to specific user roles, which are then further simplified with cognitive design components. The end result is a system so simple; one that even the least savvy user can adjust to with a couple of hours of training. blueEHR enables Sanford to implement a cash-only basis of payment as opposed to an insurance reimbursement model. blueEHR also offers a hybrid model of cash and insurance. In addition, a membership model can also be implemented. Leveraging the SDK, Sanford built additional modules for specialized workflows and launched a product that is seamlessly integrated. blueEHR’s APIs enables Sanford to not only connect to various diagnostic devices but also to integrate with third-party software applications that were used in other operational environments. 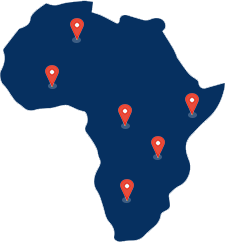 These APIs also helps Sanford connect to local health information exchanges, government registries, prescription networks and clearing houses. How to efficiently manage inventory and medical supplies, and create an efficient supply chain? The ability of a large organization like Sanford to procure items in a centralized way enables them to get better prices that are then passed on to the end user. blueEHR modules enables Sanford to accurately predict when items are needed and when they need to be re-ordered. The system provides flexibility to adapt to changes in the needs and requirement of various locations and rapid fulfilment of critical items. blueEHR’s ability to handle both centralized and distributed warehouses and procurement structures enables Sanford to exploit benefits of both. The module includes features like local procurement, packaging options, stock rotation, transaction logs and more. How to comply with the regulatory environments of different countries? Many governments mandate that medical data be stored in their respective countries. blueEHR has complied with this requirement for multiple countries including Africa and the Middle East. The preference is Amazon AWS. However, where AWS has no presence or where the governments have designated vendors, blueEHR works with those vendors provided they meet stringent criteria. To widen their resource pool and to minimize errors in translation, Sanford uses the blueEHR multilingual feature that enables input in the language of the local population. The extensive rules engine and the reporting tools enables Sanford to comply with local regulations like submission of reports to registries, health departments, and quasi-governmental organizations. With blueEHR, Sanford was able to roll out an advanced eHealth system that gave them centralized control and visibility, localized processes, and regulatory compliance, in a large number of clinics located in remote areas of the African continent in under 30 days.